Inexpensive, but rigid and good controls. 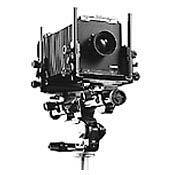 Full 4 x 5 rail camera, does everything you’d expect from a Sinar—without the precision. Lightweight aluminum structure. Not combat-ready, but Ok for any studio use. - Full movement with nice tight and smooth control. - All metal construction. - Very easy to use comparing to other models. - Very fast setup for studio and location use. - Reasonable price in eBay.